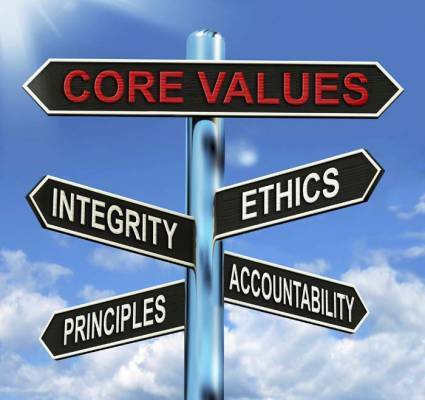 Knowing your core values and standing behind them will lead to success in your business and personal life. Unfortunately, many people cannot articulate their vision or their core values. Your values will help you with your WHY. Moreover, your why is much more important than the how. How many businesses can say why they are in business or articulate their basic business foundation? You might be surprised at how few really can. If you find that statement hard to believe then read on. Any successful business needs to have vision—that is what the business will look like when it is successful. Your vision is your dream and as Walt Disney said, “you have to have a dream if you want to have a dream to come true.” Your core values are of greater importance than vision. These are you ideals you live by. These are your non negotiables. If you know why you are in business, if you have a vision, and you have values you may then build your marketing plan and you will know how to make the right decisions. If your vision and values are clear to your staff then then they too will make the right decisions. I recently heard the news about a restaurant chain I know and their problems with the New Jersey State Liquor Authority. The Liquor Authority had targeted a number of restaurants in their chain for pouring house liquor into top brand bottles. An official from the restaurant company reacted with shock that this had happened in his company. Here is how it might have happened. If you do not make crystal clear your values and ethics to your team but only hold them accountable for profit results some may feel justified in taking short cuts. Find out if your operation and your staff is aligned with your core values.